Right now many of my summer school students have just started their writing courses. Many students are fast tracking, completing 3 years in two. This means they have many other courses besides my course. On top of this, some of them have part time jobs and a family. Certainly these would seem to be more than their share of responsibilities. Yet for most of them, this English course is the only English course they will take in their diploma or degree program. The writing that I am teaching has to give them all that they need for not only their remaining school years but also their career. How do I emphasize how important writing is to them? To any of us? 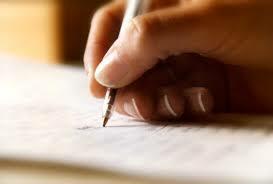 The truth is that our communication abilities will be evaluated by those who read our writing, whether they are notes, memos, letters, reports or essays. Everyday writing for leisure (text messaging, twitter and Facebook etc.) is totally different than what is expected of us in our professional writing. I have a list of tips to implement to making your writing professional. 1. Avoid text messaging terms like u for “you” or 4 for “for”. Although it is acceptable in text-messaging your friends, it is not acceptable in text-messaging for the workplace. If you practice this one rule – you will avoid putting slang into your everyday life. 2. When in doubt, double check your facts. If you are not sure, take a moment and look it up. This will avoid apologies later when you have given the incorrect information. 3. Spell check and grammar check. Those red lines in Word or Word Perfect mean you must have incorrectly spelled a word. Take a moment to find the correct word choice. The green lines mean there is most likely an error in grammar or sentence construction. If you do not understand how to fix it, change the wording to a less complicated way of saying it. 4. PRINT the document whether it is a letter or memo and proof read the paper copy before you send it. What happens when we are composing on the screen is that we think we know what we have written. Sometimes errors can only be caught after we print the document, let it sit for at least 30 minutes to an hour and come back to look at it with fresh eyes. The experts recommend letting your reading sit a day or two before reviewing but I understand this may not always fit a student’s busy life. At least 30 minutes to an hour – go and do another activity. 5. If it is an important document such as a cover letter/resume or school paper, get a friend to proof read for you. He/she will likely catch most errors you missed. 6. You could proof read the document out loud so that you would hear any misplaced words or phrases. 7. Buy a writing handbook. The resource of having an excellent writing handbook with grammar, punctuation and citation styles (MLA and APA especially)is priceless. You are investing in your future. You may find several good handbooks – only one good one is necessary.